Radio Program | The Way to God | Radio ministry to Ukraine and Brazil. The Living Hope radio program aired every Sunday at 4:05 and Friday at 9:10 by Svitle Radio remains the most viable way to reach people with the Gospel of Jesus Christ. The weekly programs consists of Christian songs and sermons on a variety of topics and resource material are offered at the close. Many of the sermons are messages recorded by Pastor John Zinchyk and others are provided by contemporary Ukrainian preachers. The sermons are powerful and concise. 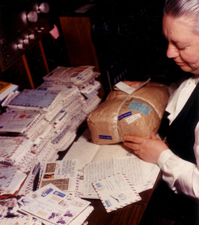 The effectiveness of the broadcast is evidenced by the amount of mail received from listeners. Today, thousands of letters continue to arrive in our Kiev office annually. As we have done for 45 years, we respond to every letter requesting our resources. Where necessary, humanitarian help is provided. The most requested resources are Bibles, teaching and music cassettes, disks and books. The most popular book is, “If not God, then Who?” by Pastor John Zinchyk in which he writes about how God protected and guided him throughout his life from labour/concentration camps, to his journey to Canada and subsequent conversion and the birth of his zeal to share the love of Christ with the people of his homeland. 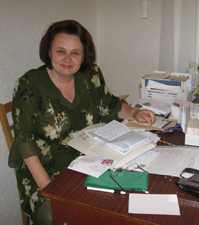 Another book that is in constant demand is the story of Jenya Polischuk called “God’s Miracle in Ukraine”. It describes her healing from an unusual paralysis which contorted her body into nothing but a twisted ball. It is such a powerful testimony that we have produced an audio version for those who cannot read. In response to specific listener requests we have produced a number of special compilations, such as “How do you pray?”, “Who is God?”, “Alcohol”, and special music. I am writing you at the request of a sister, Mila. She earnestly asked me to write you a letter because she wants to receive a cassette with the songs and the sermons of John Zinchyk, of whom we remember and like to listen to. Mila loved the song that she heard on the program that evening. The words were “ He saved me…” She repeated the words over and over. Therefore, I ask that you send us this cassette. She is over 70 years old and is often sick. She seldomly attends church but always listens to the programs. She especially likes the sermons of John Zinchyk. Her soul delights when she listens to the programs. I heard those programs when I started to search for the Lord – a road to truth and salvation. They really helped understand the truth. May God continue to bless you and work in His vineyard taking the message of salvation to our nation. I pray no storms will affect you in this work. 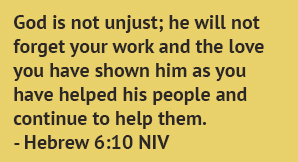 I thank God and you for your great effort in God’s work. I constantly listen to your programs. They are encouraging and provide direction. When John Zinchyk preached them from Ibra radio, my husband and I came to know the Lord through these programs. Later our son, and then the entire family accepted Jesus Christ in their hearts. Praise God for that. I have a great desire to tell my relatives and friends about God. I would love to receive that books and cassettes that you have available. May God bless you for your work. I received your beautiful calendar that is hanging on our wall that everyone can see and read the Word of God. I am grateful that you remember and pray for me. It is easier to carry burdens when you know that someone cares about you. I read your books over and over and I especially like the book “ If not God than Whom?” by John Zinchyk. I listen to every cassette over and over that you sent to me and every time I learn something new. How good is it that there is a God that loves and understands you. May God bless you more and more for taking the light to people! I listen to your programs every week and this time I ask you to meet our request and send us a cassette of sermons and songs. I will be very grateful to you. We have several of you cassettes that we listen to all the time – it refreshes us as spiritual food as this is our only joy in our life. Dear Nancy, please accept our thanks for your programs that we delight with listening to your voice. Sometimes we do not have enough patience to wait for the Monday program. Every time we listen to your programs, we eat rich spiritual food. Be always joyful in the Lord. We wait for you. We listen to you and love you. Dear friends and all workers of “Living Hope” that produce the programs for many decades. There are no words to express our thanks to you from us – radio listeners and for the joy that you gave me sending two cassettes and a book “Not possible for people, but possible for God”. I am grateful to God and Nancy that continued the work of her parents. I have listed to John Zinchyk for many years until he departed. At that time, it was the only source that gave me living water that our family could understand. I am grateful for the continuance of this program, “Living Hope”. The radio programs truly inspire us to living hope. Every program is like a gulp of living water. It is like a spark of hope. In 1976, for the first time I took a Bible in my hands. From that time I have a great desire to read the Word of God, and listen to the programs and all sources that lead me to the knowledge of Jesus Christ. I believe and hope that as long as there are people like you, and like John Zinchyk, as long as “Living Hope” exists, till then will exist a beautiful world and people. I am very happy that there is a program such as yours and I am grateful to God for this that especially your program helped me to have faith in God and our Saviour, Jesus Christ. I would like to tell you about this. In childhood, I did not receive any practical religious education. I can not recall one time that my parents would speak about this topic. Notwithstanding this, I still believed in God. I felt that without God, we can not cope with our problems. I did not smoke or drink but felt very sinful before God. At time fear overwhelmed me. I did not know why I live and what awaits me in the future, what I must do next and what was the purpose of my life. One time, when I was in despair, I turned on the radio and heard your program. I really enjoyed it – the sermons and songs. When the preacher was praying at the end of the program, I had a desire to pray as well. In that moment I repented of my sins and accepted the Lord into my heart. After the program, I had comfort that Lord had accepted me. I was 14 years old at that time and now I am 20. I am so grateful that the Lord has found me in this world. I would like to extend blessing and that many more people will hear the message of salvation through your radio program.